A pair of small glands, each weighing about four to six grams, located just above the kidneys in the rear of the abdomen is known as the adrenal glands. They secrete a number of hormones which are indispensable to sustaining the regular functions of the human body. Adrenal diseases typically manifest when a local tumor is formed, either benign or malignant, and/or an overactive adrenal gland making increased amounts of any of the adrenalin hormones. The major adrenal disorders are (too much adrenalin) pheochromocytoma/paraganglioma, (too much cortisol) Cushing’s syndrome, and (too much aldosterone) primary hyperaldosteronism. The two most followed methods for performing adrenalectomy or surgical removal of the adrenal gland/s are minimally invasive and open operation. Doctors used to make a large half to one-foot-long incision in the back, flank, or abdomen to remove any tumor in the adrenal gland in the past. Presently, with the help of minimally invasive surgery, medically known as laparoscopic adrenalectomy or laparoscopically removing the adrenal gland, can be done by making three or four incisions that are as small as a quarter to half an inch. The surgery is done under general anesthesia to make the patient unconscious during the entire procedure. A narrow tube-shaped instrument called a cannula is put into the upper abdomen or flank right under the ribs of the patient. 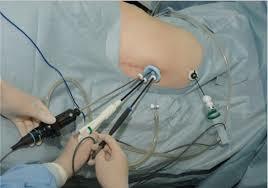 A tiny telescopic device known as a laparoscope connected to a highly sophisticated camera is passed through the cannula. It provides an enlarged view of the internal organs of the patient on a computer monitor. Other cannulas are also inserted to allow the doctor to carefully separate the affected adrenal gland/s from the tissues. The operated adrenal gland is placed in a tiny bag after being dissected free and then extracted through any of the incisions made. 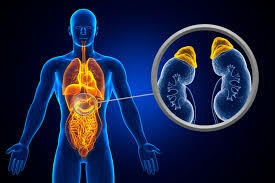 Removing the entire adrenal gland for safe removal of the tumor is almost always a dire necessity. The opened incisions are closed after the removal of the adrenal gland/s. Note: The laparoscopic procedure cannot be done in a few patients, and open surgery is performed in such exceptional cases. Research has observed that a surgeon’s experience is directly associated with the risk potential of any complications that could be caused by surgery of the human adrenal gland/s. As such surgeries are reasonably uncommon, it is crucial to find a doctor who specializes in operative procedures of this vital gland. Patients should not engage in vigorous activities and avoid heavy lifting (anything that weighs more than ten pounds) for a month typically to minimize the odds of developing a hernia at the incision site. They may take a shower two days after the operation, but should not bathe and swim for a week to avoid submerging the incision area in the water. The overall time for recovery is variable and differs from case to case. After laparoscopic adrenalectomy is performed, a vast majority of the treated patients usually resume their routine activities after a fortnight or a month. The overall recovery holiday after open adrenalectomy is substantially slower and one to one-and-a-half month’s time is generally required for recuperation. In order to do an adrenal surgery successfully, apart from the procedural skills, one also needs careful judgment as well as a sound understanding of anatomy, relevant hormone physiology, and radiology. There are many technical approaches for such operations and choosing the appropriate one needs proper knowledge of the past medical history of the patient, the anatomy of that particular patient and the lesion, and the surgeon’s skill set as well. Contact us today to schedule an appointment or undergo a consultation from our experts. Experts in general surgery. Specializing in minimally invasive surgery & robotic surgery.